John U. Lloyd Park, ABSURDLY enough, had been named after Lloyd, the attorney Broward County directed to keep beaches segregated. This SATURDAY it was officially renamed after Dr. 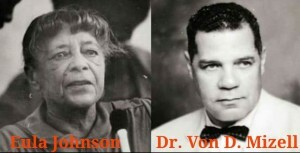 Von D. Mizell and Eula Johnson. They were civil rights warriors who, amongst other campaigns, kept at it till segregated beaches were no more in this area. A lot of the work was organized in the ground by Eula Johnson, who faced angry mobs, bribes by local newspapers (to stop her civil rights activism), and phone calls with threats against her life. As their activism became more successful they began to challenge Jim Crow standards of segregated beaches for non-whites. A small, unkempt patch, set as a segregated beach in Broward had NO road to the beach. Black beach goers had to ferry there aboard a boat called THE JUNGLE QUEEN, or drive across torturous terrain. 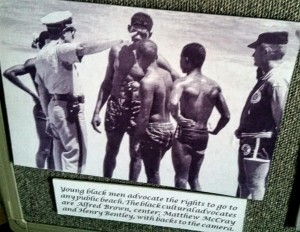 Between 1961 and 1963 their actions led to the right of black folk to swim wherever they pleased. Activist used WADE-INS to desegregate the beaches. Wade-ins are similar to the actions of Freedom Riders, where black activist organized “illegally” to show up in numbers at beaches where they had prohibited access… they would go in or wade-in the water. On SUNDAY, there was the celebration in Hollywood of “Founder’s Day”. 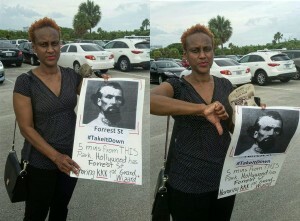 Official public records and maps prove the founder of Hollywood (Joseph Young) wanted different names for several streets in the city today honoring figures from the US civil war (Forrest, Hood and Lee) who took up arms to perpetuate slavery by fighting for the confederacy. Forrest Street, for one, is named after Nathan Bedford Forrest, first grand wizard of the KKK, who amongst a litany of atrocities, made his fortune as a slave trader. After Young passed others discarded his plans for street names and instead selected these figures for an area of Hollywood called Liberia that up to today has a high population of African Americans as residents. Given the weekend events, at the very least the “celebration” of Joseph Young’s life must address the fact that his original plans for the city’s street names were eviscerated. NOT such luck at “Founder’s Day” celebration this Sunday. They had a cake with red, white and blue icing, and a talk called, “What is Mediterranean Revival Architecture?”, a type of architecture common in Hollywood. Of note, at both events there were Hollywood commissioners, which were at hand for pictures Saturday in the renaming of the park. They give the impression of moving forward with renaming Streets in Hollywood, but seem akin to dragging their feet on the issue. Symbols are important, in the case of the street’s names, they hold the historical accumulation of old hates, and this weekend’s events, specially the renaming of the park, point to this fact. Today, the renaming of the park places those who led the fight to get access for black folk to Broward’s beaches, with dignity and freedom, at the core of the story. Original wade-ins and descendants of Dr. Mizell and Ms. Eula Johnson were at hand for the celebration. WE CELEBRATE THEIR LEGACY AND THE RENAMING OF THE PARK! BUT, of concern is the official neglect by public figures of symbols of slavery in Hollywood just 5 minutes away from the park, while at the same time participating and receiving congratulations for their help at these events on the weekend. IN THE PALPABLE NATIONAL ENVIRONMENT OF RACIALIZED INJUSTICE SOME WERE PATTING THEMSELVES IN THE BACK FOR THIS “PROGRESS”. WE MUST CHALLENGE THIS FALSE NARRATIVE LOCALLY. The irony is not lost in the fact that TO GET TO THE PARK FROM HOLLYWOOD ONE LIKELY WILL CROSS LEE AND FORREST STREETS (Hood St doesn’t cross in this area of Hollywood). They are symbols of a vicious environment that choose to pay tribute to these figures by renaming Streets after them. Those who fought to desegregate beaches back then (what renaming John U. Lloyd Park is about) would be challenging today’s public support of Symbols of Slavery in Hollywood. In fact, at Saturday’s event, NORRIS TURNER, an original activist who participated in the wade-ins back then, was discussing the street names in Hollywood targeted for renaming. A bit frail today, he’s still going strong. Mr. Turner came from out of state for Saturday’s renaming of the park. He has some trouble speaking but his niece spoke of the importance of his uncle’s work and their support of the street campaign today in Hollywood. HISTORY, SYMBOLS AND OTHER SOCIAL NARRATIVES CAN BE A WEAPON, reclaiming this park is a complicated part of remembering and upholding the legacy of struggles for freedom. Again, we should celebrate Dr. Mizell and Ms. Johnson’s legacy, and the renaming of this park. At the same time, we should also know that it’s being used locally to render invisible the dignity of historically bru talized black communities by the continued neglect by Hollywood’s public figures of these vicious symbols of slavery, and by the incoherent clamors, of many this weekend, of a hollow progress. Simply put, we should heed the eternal actions of Dr. Mizell and Eula Johnson as well as the actions of Norris Turner and his family Today. We should reclaim history and symbols as an assault on institutions perpetuating oppression. As the famed African proverb teaches us, “Until Lions write their own history, the tale of the hunt will always glorify the hunter”. This weekend was a nice celebration of those lions, it reclaims that powerful legacy, it is also a reminder of all the work still to be done.